Players and teams have to meet certain criteria to earn Bird rights and Early Bird rights, but Non-Bird rights are something of a given. They apply to a player who has spent a single season or less with his team, as long as he finishes the season on an NBA roster. Teams can also claim Non-Bird rights on Early Bird free agents if they renounce them. The primary motivator to do so would be to allow the team to sign the free agent to a one-year contract, a move that’s not permitted via Early Bird rights. Teams are eligible to sign their own free agents using the Non-Bird exception for a salary starting at 120% of the player’s previous salary, 120% of the minimum salary, or the amount of a qualifying offer (if the player is a restricted free agent), whichever is greatest. Contracts can be for up to four years, with 5% annual raises. The cap hold for a Non-Bird player is 120% of his previous salary, unless the previous salary was the minimum. In that case, the cap hold is equivalent to the two-year veteran’s minimum salary, which in 2019/20 projects to be worth $1,618,486. If a Non-Bird free agent only has one year of NBA experience, his cap hold is equivalent to the one-year veteran’s minimum salary. The salary limitations that apply to Non-Bird rights are more severe than those pertaining to Bird rights or Early Bird rights, so in many cases, the Non-Bird exception may not be enough to retain a well-regarded free agent. For instance, the Grizzlies held Tyreke Evans‘ Non-Bird rights last summer, but would have been unable to realistically use them to re-sign the free agent guard. The Grizzlies technically could have used Non-Bird rights to go over the cap to sign Evans, but because his 2017/18 salary was only $3,290,000, the club’s ability to offer raises using the Non-Bird exception was extremely limited — 120% of Evans’ previous salary worked out to just $3,948,000, which wouldn’t have been a competitive offer. In order to make a realistic play for Evans, who ultimately signed a one-year, $12.4MM deal with Indiana, Memphis would have had to use cap room or another exception. 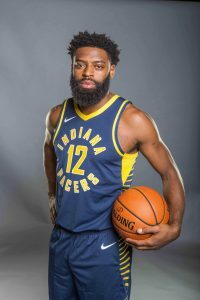 Of course, during the 2019 offseason, the Pacers‘ Non-Bird rights for Evans will provide much more flexibility, since they could use those rights to offer up a salary up to $14.88MM — not that I expect them to do so. Holding Non-Bird rights on a free agent didn’t help the Grizzlies, but there are cases in which the exception proves useful. The Spurs, for example, used the Non-Bird exception to give Rudy Gay a 20% raise last summer, bumping his salary from $8,406,000 to $10,087,200. The Celtics took a similar route with Aron Baynes, re-signing him to a two-year, $10,646,880 contract using his Non-Bird rights. Baynes had initially signed a one-year, $4,328,000 deal with Boston in 2017, so the Non-Bird exception allowed the team to give him 120% of that amount ($5,193,600) in the first year of his new contract, without having to dip into the mid-level or bi-annual exception. Meanwhile, Luke Kornet‘s deal with the Knicks provides an example of a team using Non-Bird rights on a minimum salary player. Kornet, whose minimum salary would have been $1,349,383, was eligible to sign for up to 120% of that amount via the Non-Bird exception. As such, his one-year deal with New York was worth $1,619,260. Earlier versions of this post were published in previous years by Luke Adams and Chuck Myron. Photo courtesy of USA Today Sports Images.